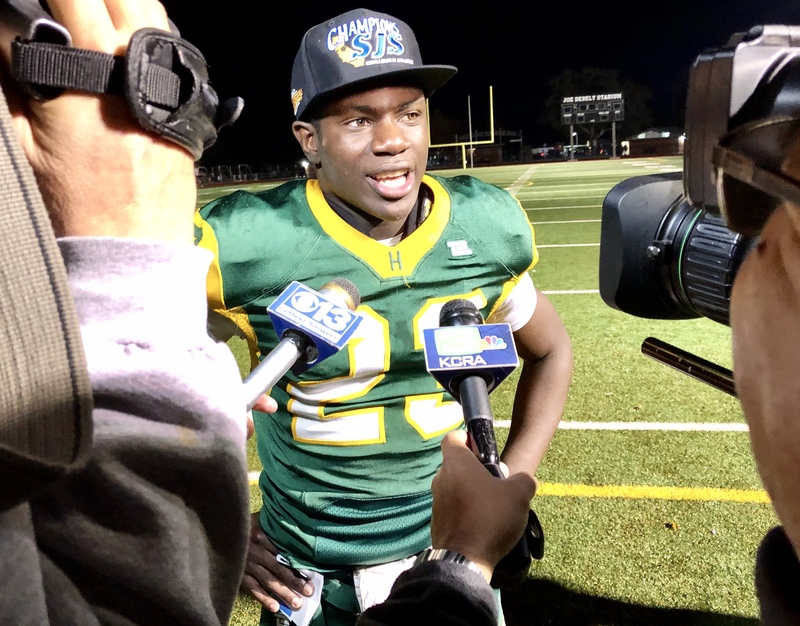 Hilmar running back Isaac Sharp speaks with reporters after the Yellowjackets' 57-14 victory over Ripon Christian in the Sac-Joaquin Section Division VI championship at Turlock High on Nov. 29, 2018. 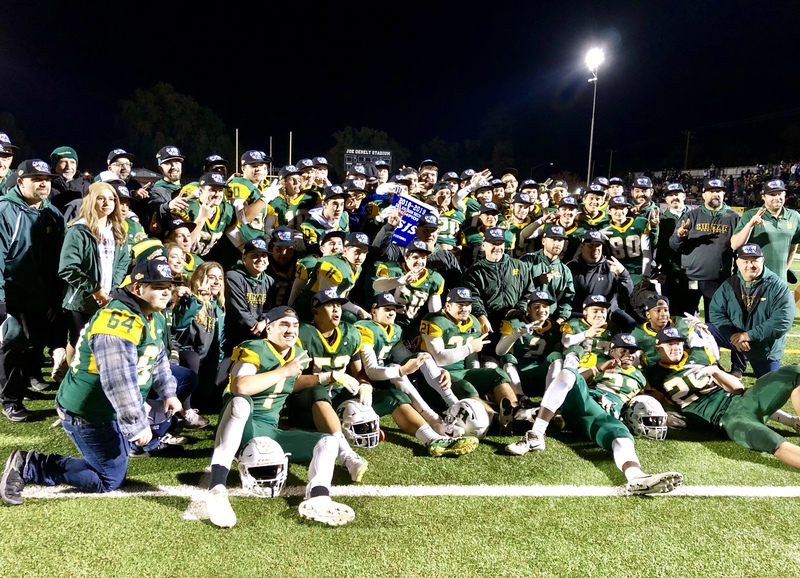 The Hilmar High football team captured its second straight Sac-Joaquin Section Division VI championship on Friday, Nov. 29, 2018, with a 57-14 victory over Ripon Christian. TURLOCK — The confetti flew above the home bleachers at Joe Debely Stadium as the Hilmar High Yellowjackets did what they do best — win blue banners. The Yellowjackets, confident and dominant, successfully defended their Sac-Joaquin Section Division VI title Friday night with a 57-14 thrashing of Ripon Christian. 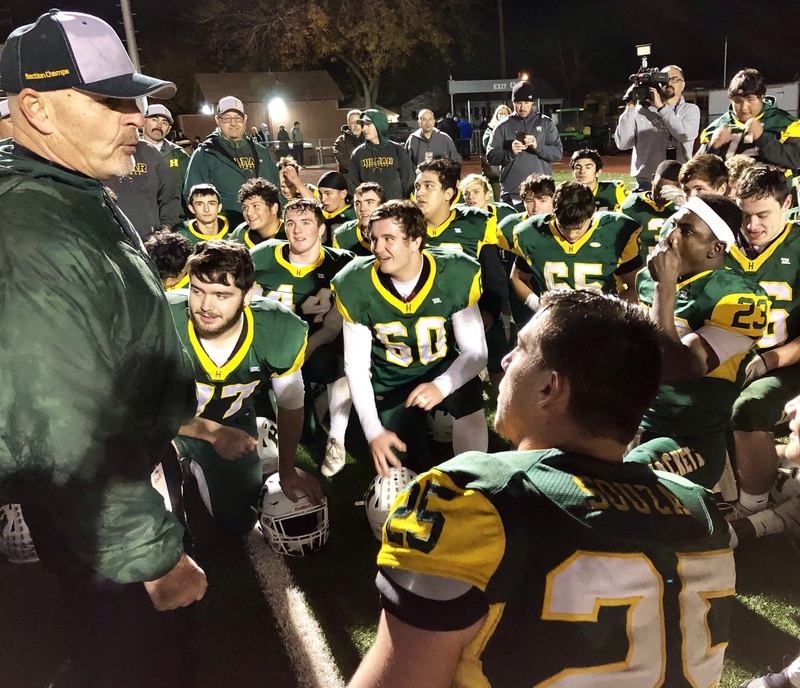 Coach Frank Marques was doused — courtesy of seniors Nick Aguilera and Justin Rentfro —after he annexed his fourth section title and the eighth in school history. The destination was not as hard as the journey for Hilmar (11-2). Though they tied for third in the always demanding Trans Valley League, the Yellowjackets probably could have beaten any TVL power this night. 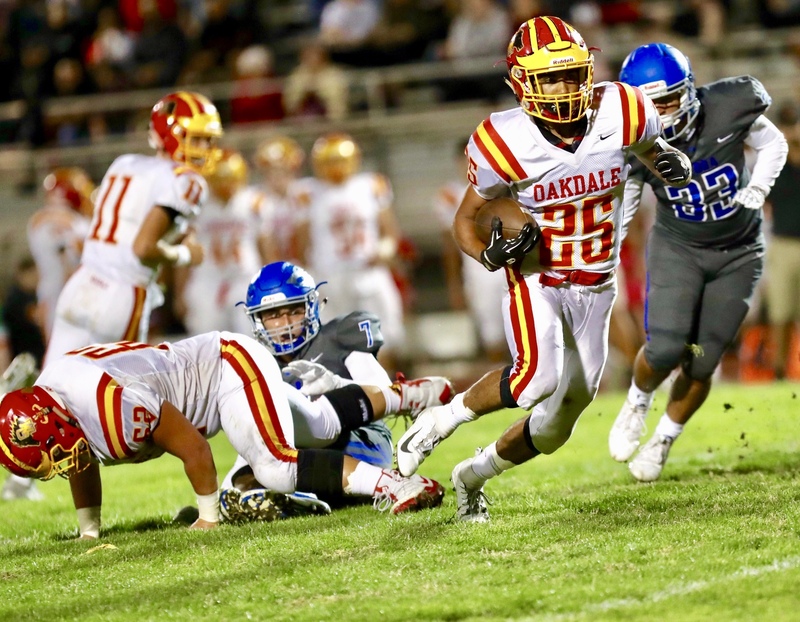 Isaac Sharp (10 carries, 111 yards) scored four touchdowns — two rushing, one receiving and one via an 80-yard kickoff return. 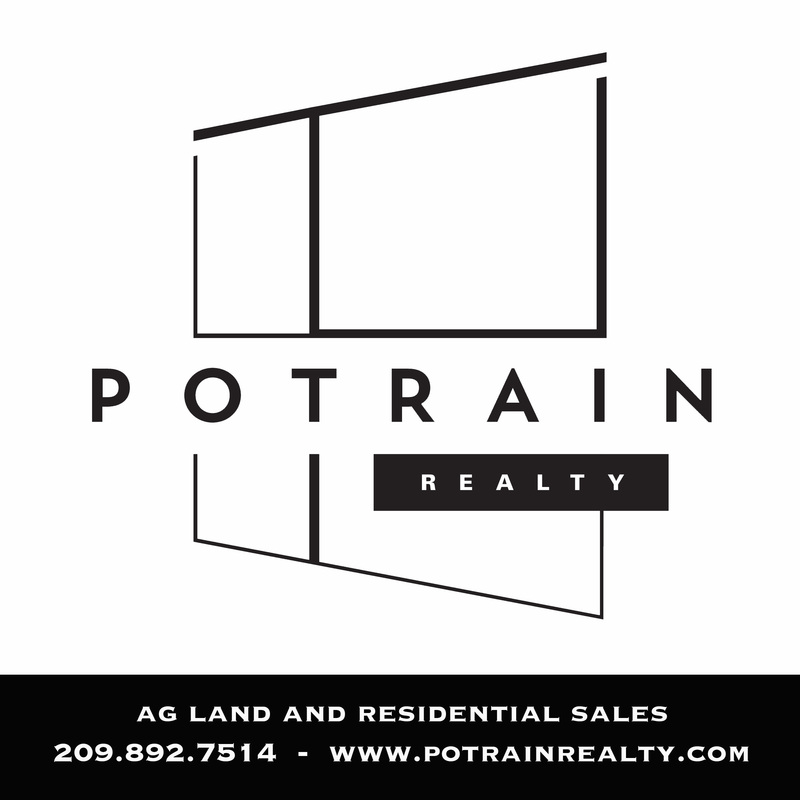 Rentfro (9 for 140), Sharp’s powerful running mate, pounded for three touchdowns. 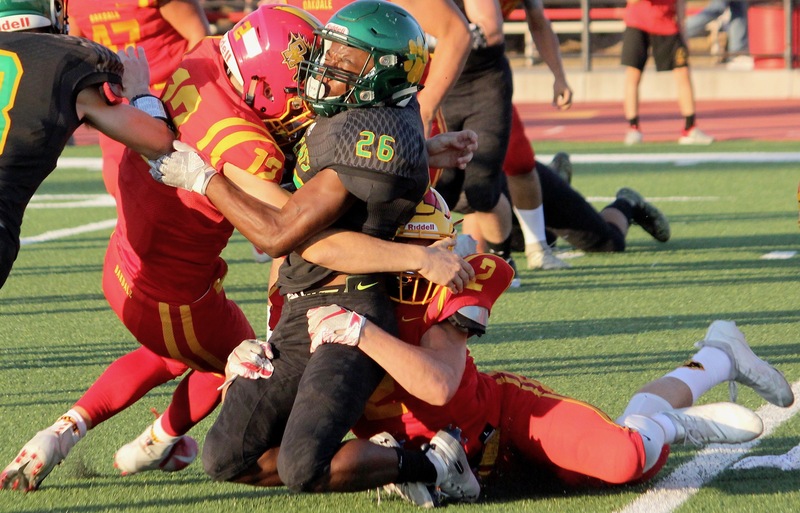 Hilmar gashed the RC defense, which allowed less than a touchdown a game, for 320 yards. Hilmar’s reward is another CIF Northern California Regional bowl game next week. Its opponent and venue will be announced later this weekend. 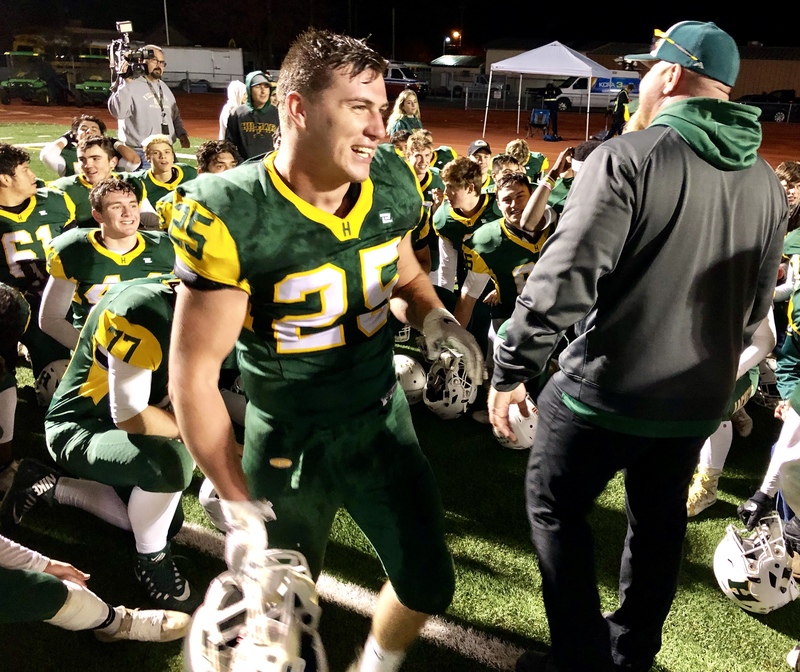 Most observers felt the section final would be tightly contested after Ripon Christian’s 25-13 upset win over TVL heavyweight Modesto Christian in the semifinals. But after a hard-hitting and scoreless first quarter, Hilmar shifted into overdrive as about 3,000 watched. The first touchdown illustrated the Yellowjackets’ potent sting. On a third-and-2 from the RC 34, Sharp stepped to his right, pivoted, nearly fell but somehow eluded three defenders as broke clear to the end zone. Simply, Sharp created something from virtually nothing. Marques wasn’t surprised. “He (Sharp) does some stuff that I just don’t understand,” he said. Ripon Christian (12-1) suddenly trailed for only the second time all season. And it got worse. Only 1:41 after the first TD, Hilmar increased the lead to 14-0 when Sharp slipped through the left side 31 yards. Minutes later, Rentfro pounded nine yards into the end zone standing up. 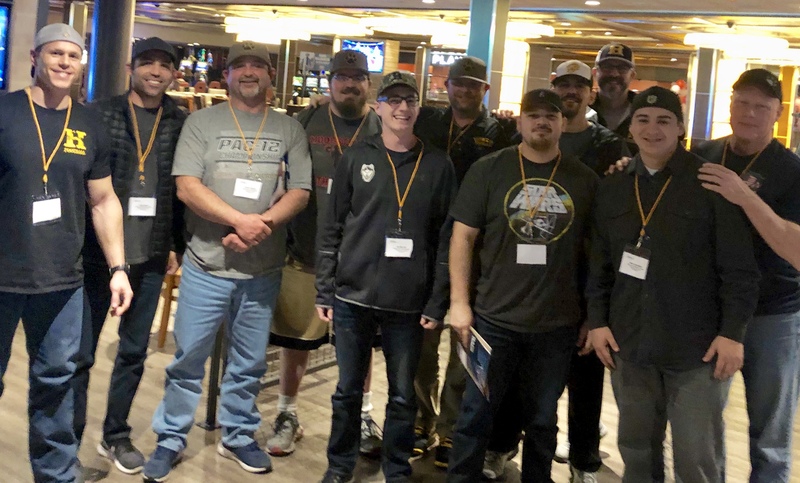 The Yellowjackets’ 28-point second quarter was capped by senior quarterback and Division I pitching prospect Treven Crowley. Rolling to his right, he threw perfectly on the run 36 yards to Sharp at the goal line with only nine seconds left in the half. That’s how it went most of the night—Sharp racing past the Knights, Rentfro gouging through them, while Crowley passed over them when needed. Rentfro’s only setback was a ripped jersey, which forced him to ditch his normal “32” number for “25” for the second half. It was tough medicine for a Ripon Christian team that had won its first 12 games for the first time in its 15-year football history. 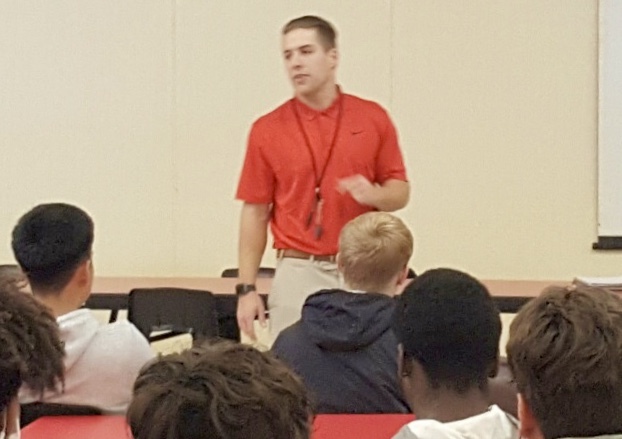 Michael Kamps, the Knights’ physical tailback who had scored 36 touchdowns, managed only 52 yards on 15 carries. Cade Alger, the Knights’ 6-foot-8 quarterback, passed for 233 yards (14 of 28) but was sacked twice and pressured by the Hilmar pass rush. Alger, who overthrew open receivers during the first half and was plagued by several drops, was intercepted twice in the second half by sophomore and playoffs callup Cole Bailey. In fact, Ripon Christian turned to its defense to break the shutout. Sean McGovern, a 180-pound junior, picked up Crowley’s fumble on the bounce and sped untouched 58 yards. Later, McGovern (4 catches, 115 yards) caught a 20-yard scoring pass. Ripon Christian also was whistled for 120 yards in penalties and lost composure during the second half. 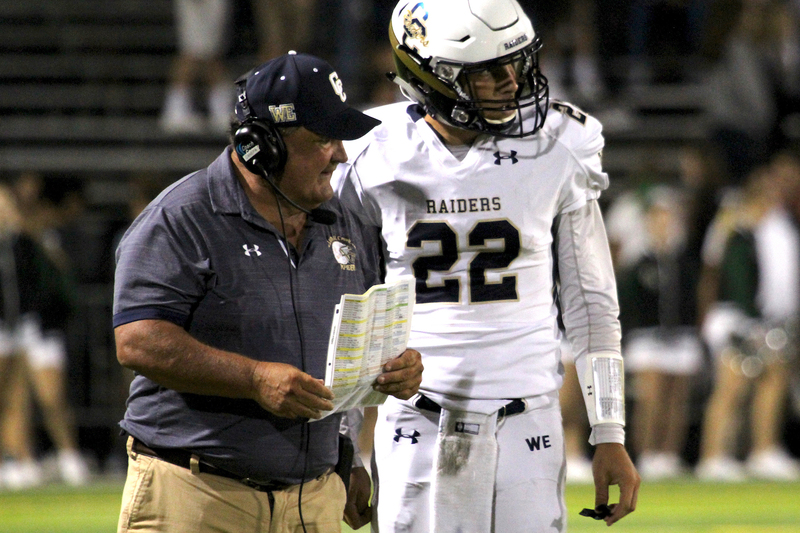 Coach Trey Ozenbaugh sought poise as he brought the Knights together for a chat late in the game. By then, the night belonged to Hilmar as it wrote another chapter in its achievement-filled record book. Hilmar running back Justin Rentfro ran wild on the Ripon Christian defense during a 57-14 victory in the Sac-Joaquin Section Division VI final on Friday, Nov. 29, 2018.